Please Join Us for an Evening of Sports Talk! 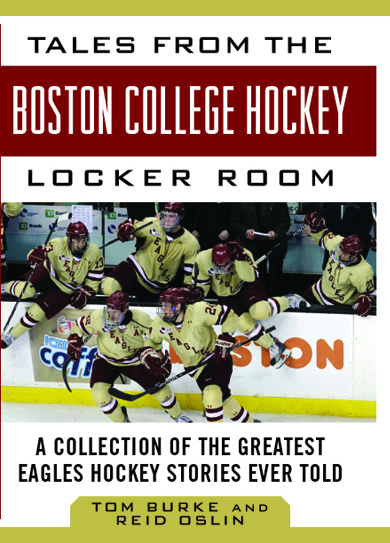 Tuesday, November 18, 7:30 to 9:00 p.m.
Tom and Reid’s new history of Boston’s sport at Boston’s college, Tales from the Boston College Hockey Locker Room, is now available at bookstores everywhere. The book, published by Skyhorse Publishing of New York, chronicles the long and successful history of “The Montreal Game” at Boston College. It begins with the early days of “ice polo” on rivers and outdoor rinks of the 1890s and runs through the Eagles’ skein of four NCAA Championships since 2001. The authors interviewed dozens of former Eagle players, coaches, and rivals along the way. Included are chapters on the origins of hockey at the Heights; on BC’s iconic coaches John “Snooks” Kelley, Len Ceglarski, and Jerry York; on the NCAA Tournament’s origin and evolution; and, of course, on the Beanpot Tournament. – Jim Reid, former Northeastern University crew captain and Winthrop High School’s first hockey co-captain. Tom Burke was Eastern College Hockey’s first national correspondent. He wrote for the Hockey News for eighteen years and was a New York Sunday Times college hockey contributor for seven years. He has served as a member of the Hobey Baker Award Selection Committee, and he annually presents the Walter Brown Award, which is named for his uncle Walter, to New England’s best American-born Division One player. Tom serves as assistant secretary of the Beanpot Tournament and has contributed to the annual Beanpot game programs for over thirty years. He also is the Boston College Varsity Club Hall of Fame’s biographer, has been the arena voice of BC hockey for twenty-seven years, and the stadium voice of BC football for thirty-nine years. Tom grew up in Winthrop, Massachusetts and now resides in West Roxbury. Reid Oslin was affiliated with Boston College and its athletic program for forty-one years, including twenty-four years (1974–1997) as the Eagles’ associate athletic director and sports information director. During this period he attended hundreds of Boston College athletic events and got to know thousands of student athletes, coaches, staff members, and fans. He served as the senior media relations officer in the university’s Office of News and Public Affairs before retiring in 2012. Oslin is also the author of two books on the history of Boston College Football. He is a native of Springfield, Massachusetts and now resides in Scituate. 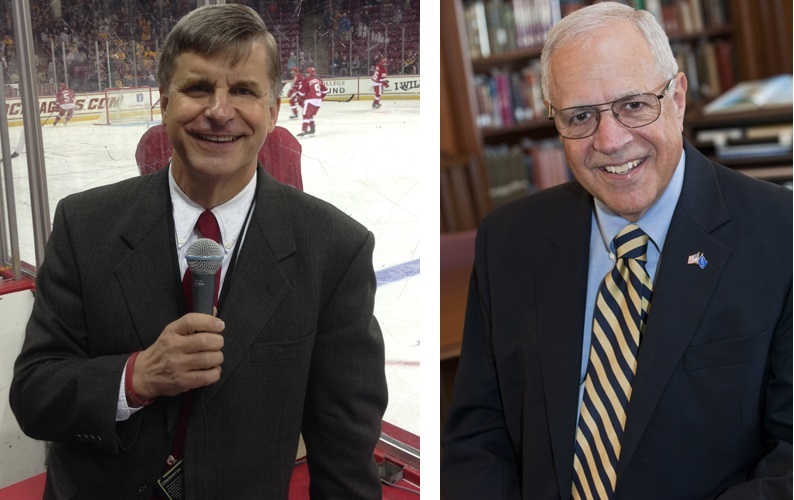 If you have questions or comments, or to schedule a talk by the authors, please email eaglepuckhistory@gmail.com. 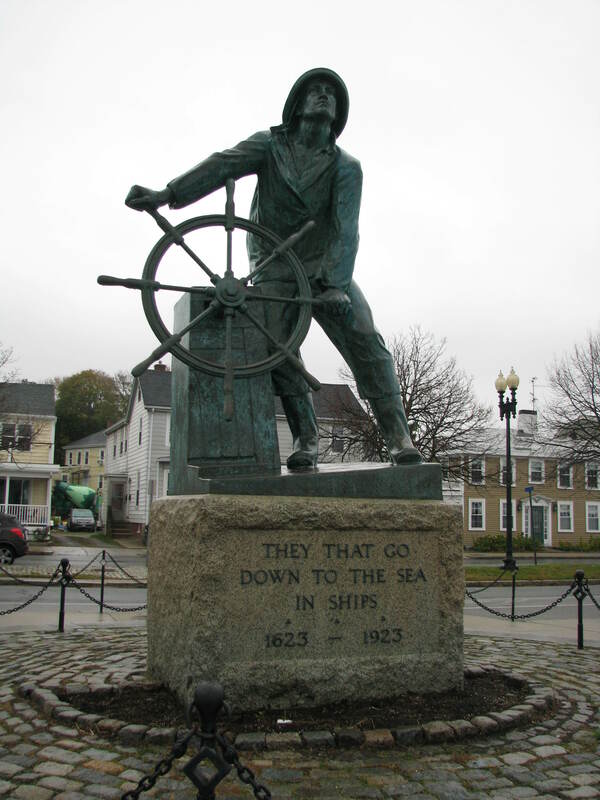 “They that go down to the sea in ships” reads the inscription on the famous Gloucester Fisherman statue. Those words touched my soul today, as I paid my first visit to the Fishermen’s Memorial. The statue draws thousands of tourists a year, and that’s a good thing. But it is more than just another landmark of this marvelous nation. It is sacred ground, a place of abiding sorrow, a holy shrine. I had come as a tourist. I became a pilgrim. I prefer quiet solitude when I pay my respects and when I pray. And the Fishermen’s Memorial is a place where one should pray. 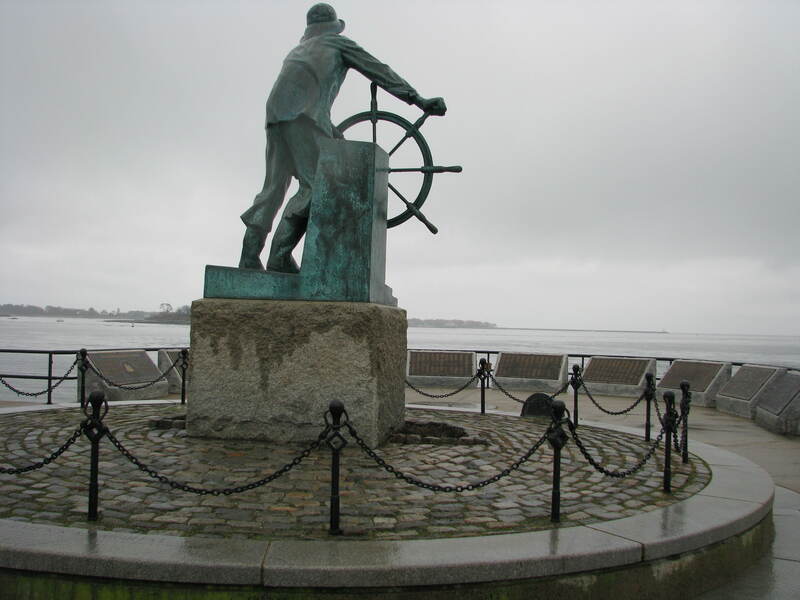 The statue, the man at the ship’s wheel, gazes intently toward the horizon. But he also keeps watch over his brothers – 5,368 Gloucestermen known to have died at sea – who are honored there. At his feet, on the semicircular wall that curves oceanward, are the plaques with the names. The first is Jeremiah Allen, deceased in 1716. The last is Peter Prybot, who perished in 2011. There is ample space below Peter’s name for additional honorees. And yes, it is only a matter of time before more names arrive. 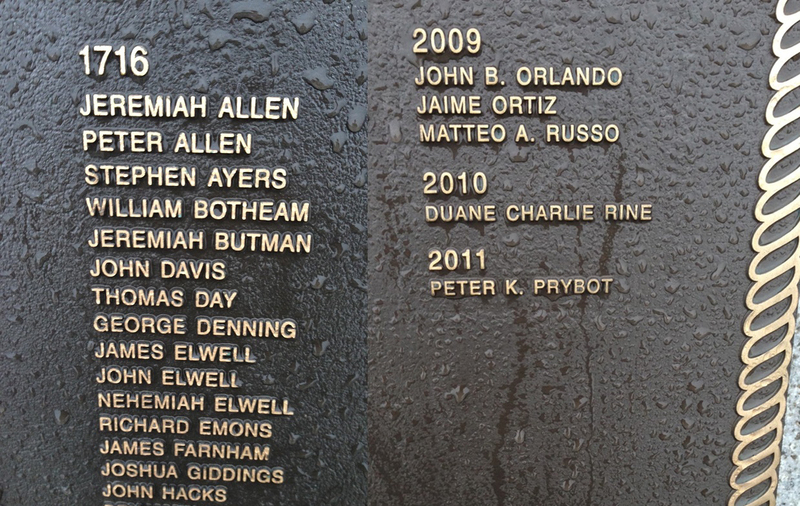 The memorial says that they were called fishermen, but they were known by other names: father, husband, brother, son. They deserve our prayers. Today, walking in the autumn rain, I gave them mine. No, that’s not why God made the sea. And I would not gainsay anyone from Gloucester who had also come to hate the sea as if it were alive and listening. I thought of Jeremiah Allan and of Peter Prybot. And of all those since Jeremiah and before Peter, and of those yet to come. Whose brother, son, father, husband were they? What were their dreams, their hopes, their fears – and their loves – that the sea has taken from them? We don’t know. Maybe some day, when they return, we will. May the Gloucester Fisherman stand strong and firm until that day, and may he be the first to welcome back his long lost brothers when the sea at last gives up her dead. You are currently browsing the Veteranscribe's Blog blog archives for November, 2014.